Something has always bothered me about the ending of Samurai Champloo. It was an ending that haunted me for nearly a year after finishing the series, its memory resurfacing every time I thought about it. Midicronica’s “San Francisco” was in many ways a fitting ending for an anime which drew so heavily from hip-hop and reggae culture, but there was somehow a disconnect. Samurai Champloo’s ending always struck me as unbearably happy, like the colors on the screen and the chords of the song were attempting to sweep something under the rug. As the anime ends, the journey is over, and its end is just like its beginning: three people, alone. From scene to scene as the credits roll, Mugen, Jin and Fuu move steadily through differing landscapes, in different directions, further and further away from each other. The first time I watched the ending, there was a boulder in my stomach; I felt like I wanted to cry but it just wouldn’t happen. “That’s it?” I thought. After everything the three had been through; after overcoming their own personality flaws, government officials, assassins and more than one bout with starvation, they just walked away? Even though they each had not another soul in the world to rely on? It wasn’t an unsatisfying end: Fuu met her samurai, Mugen and Jin had their duel. However, in meeting their goals as characters, the thin threads which held them together all of a sudden ceased to be. What Samurai Champloo repeatedly highlights is this simple act of walking away. That at any moment, as Fuu’s did in the first episode, one’s entire life could burst into flame, leaving you with nothing. The tragedy of its ending is only in the hearts of its viewers, as we realize just how tenuous our relationships with others are. The things that movies, novels, and anime trick us into thinking are commonplace – eternal friendship and love, happily-ever-afters, never ending journeys and magical spells – are nothing but romanticism. We encounter hundreds of people in our lives, and bond with a select few. The vast majority of people we meet end up as nothing but passing acquaintances, nothing but people that we simply walk away from. Fuu, Jin and Mugen part with a simple “‘Til we meet again”-eqsue phrase, departing to a world so violent and uncertain that this is nothing more than an unvoiced hope. The separation feels forced: there was no real need to part ways. There was no new direction in each of their lives other than they want to live, and the reason for such was that they found each other. So why part ways then? You said the thread that binds them together ceased to be? Sure, but they were replaced by unmistakable and steel chain tough cords of friendship. Parting at this point feels like an attempt to force some symmetry to the idea that they were all loners to begin with. Hmm. Like I said above, I think the tragedy (as well as the feeling of it being ‘forced’) is only in the minds of the viewer. Then again, since the three are figments of someone’s (brilliant) imagination, that’s the only place where it counts. I don’t know if i would have liked them to stay together happily-ever-after honestly. While friendship is something which, certainly, is nurtured by proximity, I can’t see any other reason for the three to not part ways other than “just because”. I suppose it’s hard to watch because we place so much hope in the characters, and genuinely want them to have something more in life than themselves. In which case, bravo, Mr. Watanabe, you have created true empathy. Great post this, and rather bateszi-style. “The tragedy of its ending is only in the hearts of its viewers, as we realize just how tenuous our relationships with others are” really sums it up for me. What makes it all the nicer is that they kind of acknowledge that they have some value to one another, that they’re friends, but they know that they were mainly bound together by dissatisfaction. The whole journey is based around Fuu’s unsatisfied longing, Jin and Mugen get their own sorts of malaise too. So the breaking of the bond really is a satisfying moment for them, although maybe in a series so given to meanderings and side-plots the appeal (for the viewer) of a Freedom End isn’t so great. Bateszi-eqsue? I must admit, this is a conscious choice. I often find that with group blogging situations, particularly if someone joins midway like I have, that the post+writing styles often differ so greatly that, to a reader, it’s jarring. I try to keep that in mind as I write; there’s nothing worse than seeing a blog go south because of new blood. Then again, i’ve been reading the blog for quite some time (a few years before this comment, at any rate) so likely even without trying it would still sound bateszi-eqsue. Interesting note on the journey being based on “Fuu’s unsatisfied longing”. I’ve never thought about it that way, but I think it’s definitely true. Given the way the first episode played out (Fuu standing in a pile of rubble) I always viewed the entire series in a destruction-breeds-creation kind of light. And in a sense, the ending plays out this way, too: We’re reminded that the Meiji era, and its general elimination of samurai is just on the horizon, the demons of Fuu, Jin and Mugen are respectively put to rest by the final episode, though they’ve come near-death to do so. In that way, the ending was suiting. If this didn’t come across in the post, I actually quite liked Samurai Champloo’s ending. Even if it left me with a bit of an icky feeling, I think that making anyone feel anything via a passive medium – namely, television/animation – is an incredible feat. I first watched Samurai Champloo in 2006 (or so my dvd-r says); and it literally bothered me for a year afterwards. I can’t help but respect the series for instilling that level of emotion with just its ending – let alone the rest of the journey. Reading this post made me think of my office mates. These are people I spend so much of my time with; in some cases, I’ve been sitting in the same room with them for years on end, but sooner or later, we all get new jobs and move on; suddenly someone leaves and that’s it, they are gone for good; an empty place where they used to sit. It’s a weird feeling, but not necessarily tragic, it’s just the way of things. I think it gets easier to accept as I get older, and just means that all the time we spent with each other is all the more remarkable and ‘fated.’ I think that’s why Jin, Mugen and Fuu weren’t so depressed at the end; they weren’t as much lamenting their parting of ways as reflecting on the times they spent together, despite always knowing deep down that their paths would eventually diverge. Really lovely post, Celeste. Hmm, I understand what you mean about workmates. Work as well as school, I think, are some of the weirder situation society ever puts us in: they push people together, and for only two reasons. In the case of work (in a typical office or even most retail settings) it’s task sharing towards a common goal (generally profit). In the case of school, it’s by age, and age alone. In particular school is a sore thumb for me: in theory, I’d be entering my final year of university this September (had the thought of doing my design grad project not horrified me to the point of running away to travel for a year!) and I simply wonder how many of these people will pass on by. These are people that i’ve spent long nights in computer labs at school with, eaten out with on more occasions than I can count. I can’t help but feel that regardless of all we’ve experienced together, it will end up as simply a footnote in our lives. It was a tough ending to take! I felt a bit of relief that they didn’t walk into the sunset together bickering – the cheap, common, pleasing ending – and yet a larger part of me badly wanted exactly that. They went for the ending that indicated that despite the fantasy sequences and weird events of some episodes, it was a show of real risks and real consequences, in which people change and no one lives forever. Three years later I finally got the closure I was missing, thru watching Michiko to Hatchin. I nearly dropped it early in, stuck with it, was drawn ever deeper, and I have to say that it has the same kind of epic sweep with wild diversions that Samurai Champloo had, plus the really really good ending that SC reached for & didn’t quite achieve. For some reason your post made me think of the controversy surrounding the series finale of ‘Lost’? I know people online seem dissatisfied with the way the creators of ‘Lost’ tried to tie everything up. Do you think the creators of Samurai Champloo (given the constraints of a 26 episode series) could have ended the show in a satisfying way? Gotta agree with the ending of Michiko to Hatchin. Very bittersweet in the non-obnoxious manner. I’ve always assumed they were heading back to pieces of their lives that had been on hold. Jin is off to the temple to find the woman he fell in love with, and Mugen was off to find the woman that wanted to marry him. Funny thing about Champloo, it might not be the masterpiece that Bebop is, but its the anime I have rewatched the most. Its supremely entertaining on so many different levels. Bateszi did u ever get around to checkin my post on ur last LOGH article? Incredible anime man. Glad u recommended it. Cool, I’m glad you liked it. LOGH is the type of anime that ruins you for months after, just because it’s so good. So many good characters and epic, sweeping story arcs. Not sure if you’ve seen this article yet, but it’s basically my run down of all the great moments in the series I could remember. I always found the ending to Champloo to be surprisingly hollow and I wasn’t sure why up until I read through these posts. I just never quite grasped why they abruptly split up, and I’m still not entirely persuaded that it’s a likely outcome given the chain of events in the show. Still it’s something fairly interesting to think about and certainly one of those pieces that gives Champloo it’s unique mood. Japan always thought of the world as fleeting and evanescent. They separated because they really had different paths to travel. It may have been fate that brought them together, and friendship that kept them linked, but nothing is forever. I thought it was the ending was the quintessential Japanese acceptance that life goes on. I was thinking that Jin was off to get the woman he promised he would return to; Mugen probably would marry that detective (was it? ); and Fuu gets on with her life having made peace with both her father and herself. As much as I’d love to say that I can stay friends forever with the people I’ve heavily bonded with, we all have our lives to deal with. It’s a sobering thought, but as we grow older we simply learn to accept it and move on. We won’t stop being friends: we just have our lives to live. I wish I had anywhere near the level of acceptance that you have. I’m still green, I guess 🙂 Somehow though, I think that learning to accept things like this is tragic: as we dull to the sadness of others (and ourselves) moving on, we lose something which made the world as colorful and intense when we were young. That, to me, is unbearably sad. That said, I like the comment on the it fitting with the Japanese worldview: you’re entirely right, I think. The appeal of “never-ending” stories is the fact that when you really love the characters, you’re willing to suffer a lot of unnecessary stretching of the story if it means that the characters will be together for a long time. It’s not the same as a happy “together forever” ending (though if well executed, it can be really pleasant as well), because only when the story goes on can the readers/watchers feel that they are part of the group. When the characters are really good, you befriend them, sometimes even fall in love with them, and the pain of separation at the end is as real for you as it is to the characters. There’s a slight undertone of this even in the happiest of ending, if you’re attached to the characters, because even if the characters don’t separate, you do: you can no longer be part of the group when the story ends. I think the end of Samurai Champloo, if it could somehow be viewed by people one hundred years ago, would actually be less strikingly sad than it appears to us as modern viewers. 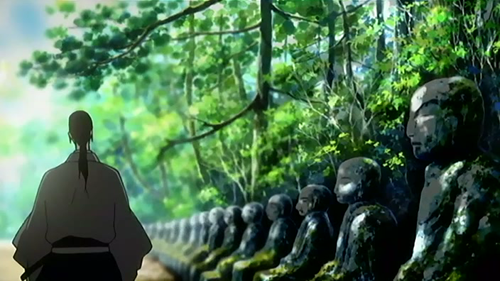 I think you get at this somewhat when you talk about the tenuousness of relationships and the fact that we meet many people but only truly bond with a few; however, I think that Samurai Champloo viewed during the digital age presents us with a disturbing conclusion in part because we have become accustomed to not having conclusions in our relationships. In fact, if anything, relationships ending actually requires an effort on our part give the high-connectivity we’ve become used to – that kid you sat next to in 2nd grade? You’re Facebook friends! Your best friend from high school? You email each other every week! That co-worker you passed the summer with at that crappy grocery store job? Well, you still read their blog from time to time. 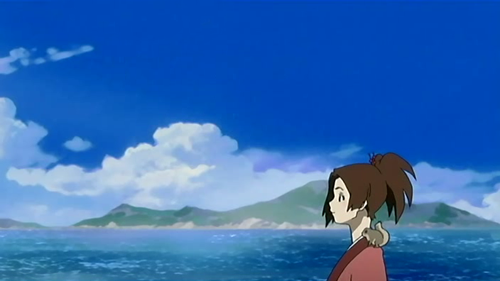 In Samurai Champloo, though, it is very obvious that the parting of the characters is the end of their relationships. They don’t have cell phones or computers – hell, even regular old mail isn’t really established at all yet. So to us, to see three people who have formed strong bonds with each other leave each other forever is extremely haunting.